Travel budget tips can certainly help you an you when you are on the road as every cent counts, so we asked our TAWKers already travelling to give us their top travel budget tips. Check out the TAWK Support section of our website for campsites, caravan parks and businesses and grab the TAWK Membership card as these guys are all offering you guys a discount! You will get at least 2 night's FREE camping for the kids (some do kids stay free for the whole stay!) And we are now getting more businesses offering TAWKers discounts on Goods and Services and we are now starting to expand in the Attractions area - so check them all out and often as more come on board. If towing, don't always use cruise control. Driving long distances, you may not always notice the rise in the gradients of the road and all that gear changing can increase fuel your consumption. Keep tow vehicle maintained well! This is your lifeline on the road so ensure you take all possible precautions and keep it well maintained. Not forgetting those all so important tyres on all vehicles. Use a Deal saving website like Scoopon or Groupon! We've often used these as you get some really great discounts for dining out and activities. You can just put in where you are and save! Free Camp as much as possible. If you are in or are heading to a particular area and want to know if you are near a good free camp spot, then pop the question on our Facebook page. TAWKers out there are always happy to help. Download the Wikicamps App! Not just for camps but for things to do, water and dump points, etc. also. It really is a great way to see what others think of a spot and you can filter for things that you are looking for. It certainly helps plan your travels. Showgrounds often offer camping and whilst not free, they will be a lot cheaper than caravan parks. Do your homework and see if this is available on your route. Ask for a better price! Don't be shy to ask a caravan park for a better price or if you can get a child for free. Many of the privately owned ones will do that for you. If you don't ask, it's already a 'no'. So ask the question, you may be pleasantly surprised. You have extra time, so shop smartly and plan meals. If you plan on eating out as a treat, always do it over lunchtime, lunchtime specials are ALOT better than dinner times. When you do day trips, pack snacks and drinks, PREPARATION is the key! Download a fuel app. We always check fuel prices for the journey we're about to take to plan where we will full up cheapest. If we're leaving a main town we always fill up the jerry can for when fuel is more expensive down the track! 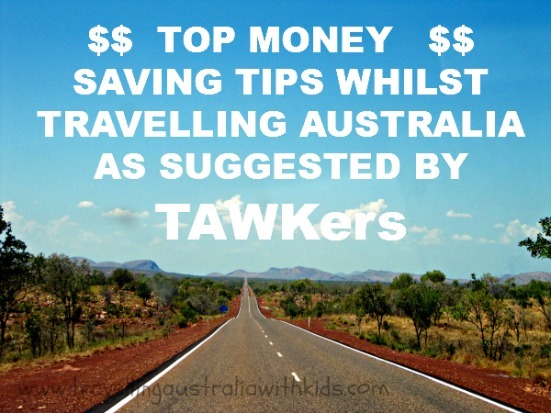 Thanks TAWKers for all your Travel Budget Tips! Ice creams - buy in bulk. All the kids love an ice cream (and so do the 'grown ups! ), but buying them at the shops/road house can get expensive, so stock up when on sale at the supermarket. Op Shop shopping can really save you heaps and of course, you are helping a charity at the same time. As you travel through different states, weather can change dramatically, this way you can travel light and stock up with the clothes you need to suit the weather as you go. Washing machine. Consider buying a little washing machine, or one of those buckets with the lids on, that you pop in the van/trailer/car on route and it washes as you travel. Of course there's always the good old hand washing too. You'll be surprised just how much washing costs you on the trip. Do a mix of both free and caravan park camps to assist with accommodation costs, some caravan parks you can negotiate a weekly rate for your family. If you have an ABN, register as a MYSTERY SHOPPER, you might not get 'paid' a lot, but often in the more remote areas you can negotiate. I ended up getting paid around $80 per shop in some areas - Coober Pedy and Yalara, it can all add up and you may be going there anyway. Track your Expenses! This way you get to see where you are spending and where you can save. 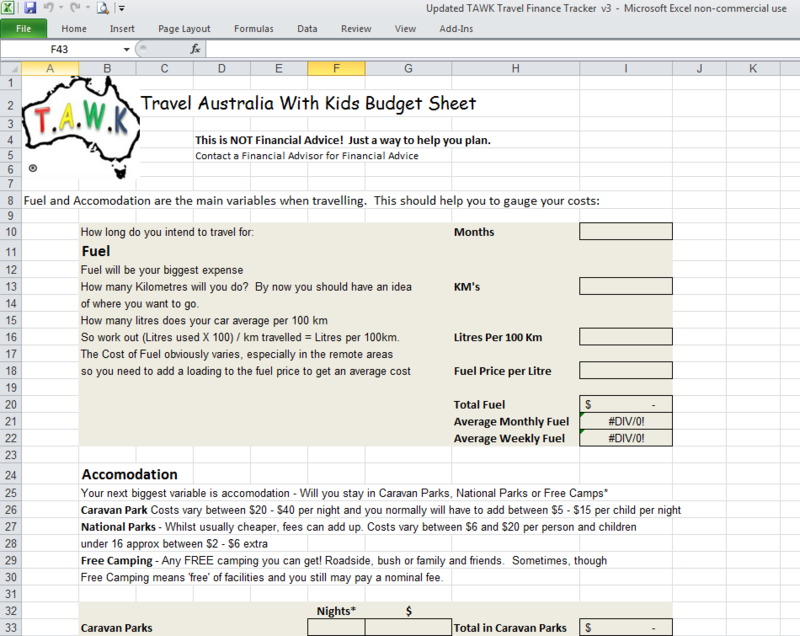 And see if our travel budget tips work! I used to track ours and after a couple of months you really can see where you are spending and what you can do to change things. It helped us to have an extra YEAR on the road! So I have now created a TAWK Travel Finance Tracker if you wanted to do the same. Definitely record all your expenses. You don't spend as much when you see the numbers in front of you!! One thing that we used to help us, was our Finance Tracker. It helped to turn our one year into two! There's also a section at the front to see how much your trip might cost! Local Knowledge. Definitely one of our top travel budget tips. Ask the locals. The tourist centres are fantastic but nothing beats the locals for advice on those secret cheap spots to go and see and of course if you are to go out to eat, they will also have an idea of the best local food at the best prices. The local pub can be a good spot for meeting the locals. Tourist Centres. Even after the above tip, tourist centres are great for finding out what is to see in the area and the pamphlets therein, often contain discount vouchers. They will also know if anything free is happening locally. Apart from fuel, food is probably the next biggest expense you will have. I recommend shopping at roadside stalls, farmers markets and packing a picnic lunch whenever possible. Do your own research and do not just get sucked into the beautiful brochure and what it promises. 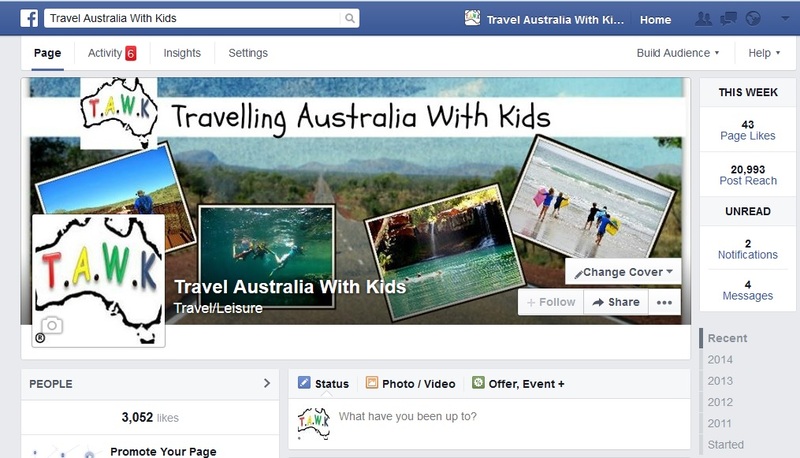 Ask the other travellers you see and again, ask the question on our Facebook page. Someone will have been there and have their thoughts for you. BUT remember take the advice lightly, they might like things that you don't and vice versa. Local Councils. Maybe you mightn't think of this one, but often and especially during the school holidays, the local councils run free activities for kids. We often joined in these activities as the kids were busting to meet other kids, so a win win. Utilise WiFi hotspots to save on data (Information Centres are great for this), and make sure you chat to locals about the hidden gems to visit, sometimes the best places to visit aren't the commercialised places. Ensure you regularly service your vehicles and rotate tyres to avoid any nasty (very costly) surprises. Best of all!! Start your own online business or Travel Blog and see if you can make a bit of money with it too - see here and work as you travel! Find out more info here. 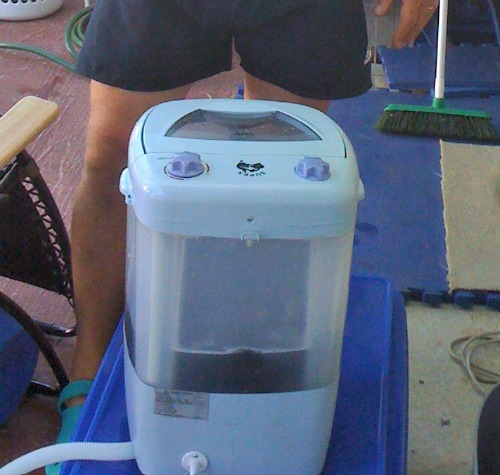 Washing small amounts of clothes at a time so you don't need to use expensive washing machines. And minimise perishable food as it can waste quicker on the road. Doing your washing in a 20lt screw top bucket in milk crate as you go along (agitates like washing machine) rinse and hang out. Lot of people swear by wool wash with no need to rinse. Make morning teas and lunches rather than buying at road stops. Travel slowly! Spend a couple weeks at least at nice places....being on the move is a lot more expensive...it's all about making the available funds last longer.